Many leaders lead by demonizing the “other”, and threats and blunt force are the only communication used to work out disagreements. War is increasingly becoming the ultimate solution of choice. Where can we watch stories about all this - and even meet - and in a fun way - someone different than ourselves? The mobile Video Game: Online gameplay in real time, without regard to national boundaries or differences - is an opportunity waiting to be used. Our mobile AR game will begin with players entering their country location - and then teaming up with a partner they choose in another location (initial game dollar amounts will be larger depending on how “different” their two locations are - New York or Israel very different than Dubai, or Tehran, or Sudan). Using semi-realistic bitmojis players create, the pairs will get to know each other, trading photos and short videos of significant places in their home towns (and taking “virtual double selfies” that include their two avatars). Reaching a certain level, pairs will go through a portal to Virtual Jerusalem: an animated Jerusalem, where together they have to visit key places: the Temple Mount/Al Aqsa, Palestinian and Jewish neighborhoods in the Old City, and elsewhere. They will interact with computerized allies and enemies - rabbis and sheikhs, wise old women, and other surprising characters - and like in the movie, they sometimes have to take selfies with them also. Eventually, after real world voting among game players, some of the most popular double selfies will be included in the feature movie itself: whether in the master cut, or in “special editions” of the movie shown in separate countries or regions. The liberating idea: “We are the media”. 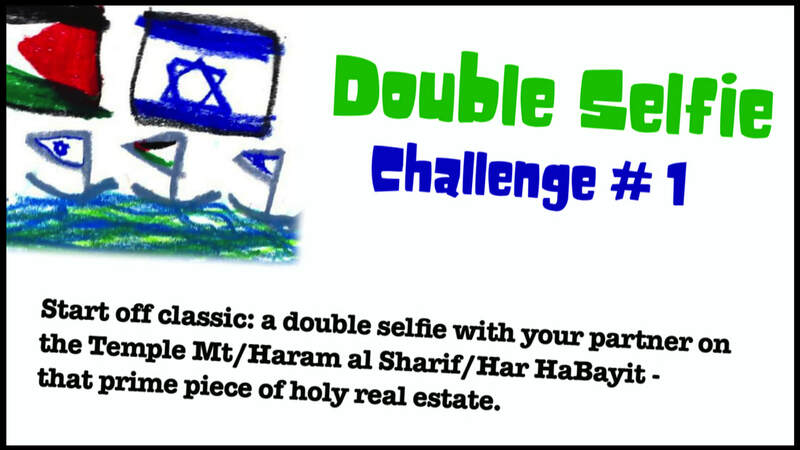 “Double Selfie” Transmedia Project uses multiple communications platforms to reach & cross-fertilize demographics. It redefines ROI, extends project shelf life, and creates value-added IP assets and ancillary revenue streams. We are looking for partners to join our Israeli/Palestinian/global team: investors, co-producers, video game designers, and others. Contact us to talk!